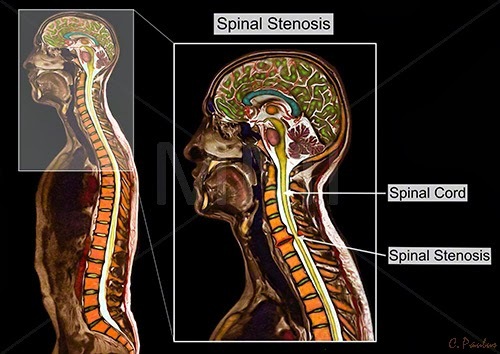 Medical Media Images has produced a new series of Color MRI images demonstrating the condition of Spinal Stenosis in the neck. These new images showcase a disease which is often difficult to understand. The image above contains the two Color MRI images. The image on the left is a "Whole Body MRI" which is used to show the viewer where the right sided image is taken from. The right sided image shows the neck area as a blow up of the shaded area shown on the whole body MRI. The image on the right shows bone spurs which have developed next to a degenerated disc as well as bone spurs (red) which have developed on the back of the spine. 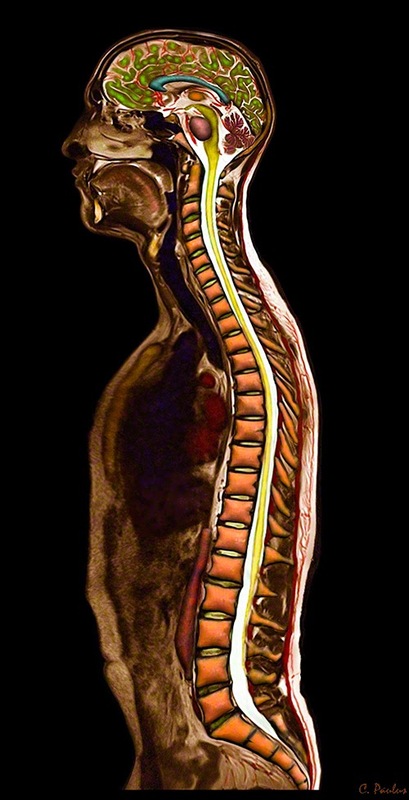 Both of these areas of bone spurring are pushing towards the Spinal Cord (yellow). The narrowing around the Spinal Cord due to the bone spurs is referred to as "Spinal Stenosis".